Hednesford Town continued their perfect start to the season at Keys Park as Rob Smith’s side recorded their sixth straight home league victory to move four points clear of the chasing pack at the summit of The Skrill North. The Pitmen coasted into a 2-0 first half lead as their opponents from North Wales, while threatening intermittently on the counter, struggled to deal with a fluid midfield and lively front two of Michael Lennon and Neil Harvey. Francino Francis did well to block a Jamie Crowther shot at point blank range on six minutes before towering above the Colwyn Bay defence to head the opening goal on nine minutes. Francis’ looping header was saved well before Harvey headed on to Lennon who then brilliantly played in the advancing Jamey Osborne to calmly dink the ball left-footed over Chris Sanna for the second goal on 34 minutes. Marc Williams hit a looping volley onto the top of the crossbar just before the break and although Elliott Durrell and Harvey both had chances to put the game to bed, Williams capitalised on hesitant defending by Alex Melbourne to halve the arrears on 64 minutes. 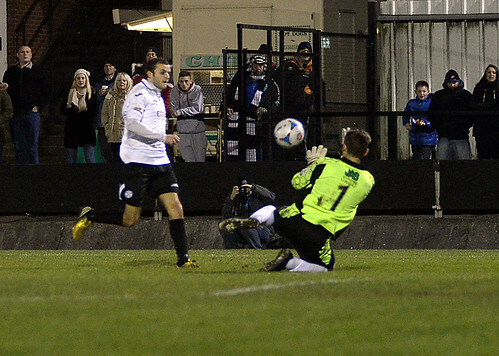 The Pitmen introduced new signing Tom Thorley for his debut to shore up the midfield as pressure mounted. 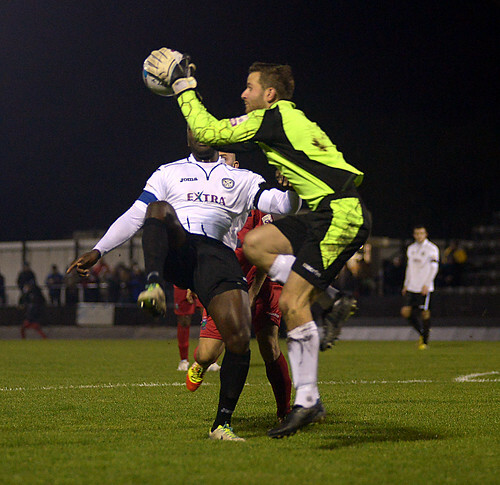 The away side came back into the game strongly as Hednesford’s minds possibly looked towards Saturday’s FA Cup tie and Colwyn Bay were unlucky not to equalise in the final fifteen minutes. Williams weakly headed at Crane when well-placed, John Disney hacked the ball clear off the line from a late corner and then Williams hit the cross bar with a close range header. Harvey and Durrell both had further opportunities to finish the visitors off on the counter but The Pitmen held firm to strengthen their position as early season pace setters ahead of their massive clash against Crawley Town on Saturday afternoon.